The Deans of Domestic Pursuit, Suzanne Pollak and Lee Manigault, want to bring back the lively days of entertaining at home. I’m with them. Thank heaven for the Deans. I wrote about them last year for the Washington Post, just when their book deal was coming together and here their book is OUT ALREADY! 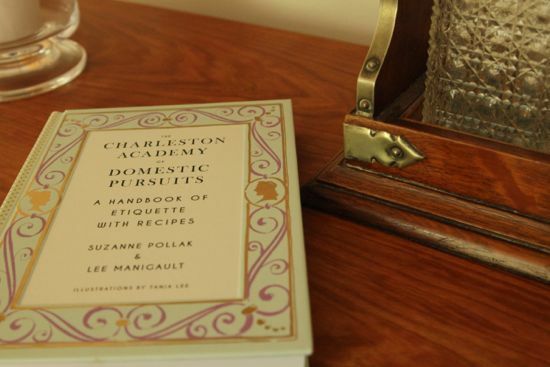 The Charleston Academy of Domestic Pursuits (Stewart Tabori and Chang) is the most charming, funny, down to earth, sweetheart of an etiquette book. It’s perfect for a graduation gift, bridal shower prezzie, or a fun read for your own self. I predict you’ll soon fall prey to their Southern charms. I think I picked up a little accent by the end of the read. There are dozens of go-to recipes, classics like Hollandaise and Remoulade sauces, and even something called, intriguingly, Beef on a String. These are easy to pull off foods, that will make you look like a brilliant host. To wit: Any-Fool-Can-Make-This-Fool with strawberries, balsamic and a lot of cream. 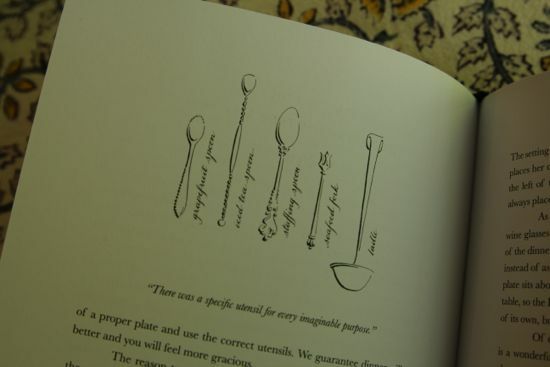 Look at this adorable illustration putting a name to some of those pieces in your grandmother’s silver set. There are tips galore, side notes, funny stories, and Rules, sure, but don’t overlook the recipes. Well written, reliable, and old school, in only the very best way. When is the last time you even used the word canapé? 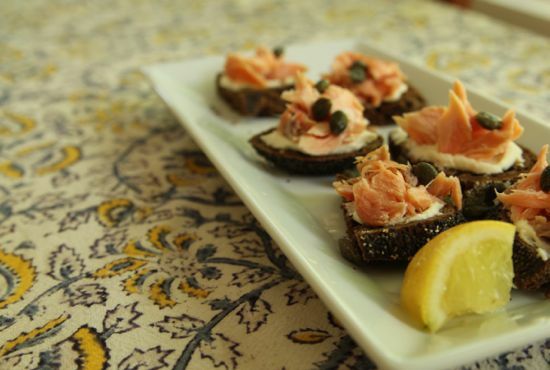 Once you taste these adorable salmon snacks, canapé will become part of your vernacular. And, yes, I do realize this is the second post in a row with salmon and a spread. Two reasons. The first, my Dairy Godmother gave me a gift of newly cultured crème fraiche. Right now, the wild onions are in season and her cows are gorging on them as if there were M&Ms out in the pasture. The cow’s milk comes in a little oniony, and that flavor is enhanced in the culturing process. It’s divine. On a canapé? It’s perfection. The second reason? I smoked a big hunk of gorgeous Atlantic salmon just last week. It’s in season and glorious and I do love me some salmon. The nice people at Stewart, Tabori & Chang Publishing have a copy of this delightful book for one of my readers. Just leave me a comment — tell me about your favorite way to entertain, or your favorite reason. I’ll randomly select a winner next Monday, May 19. Congratulations to Annie who won Marisa McClellan’s Preserving by the Pint. Cut the bread into triangles. Smear crème fraiche on each slice and pile high with the salmon. Drizzle with the juice from the lemon and top with the capers. 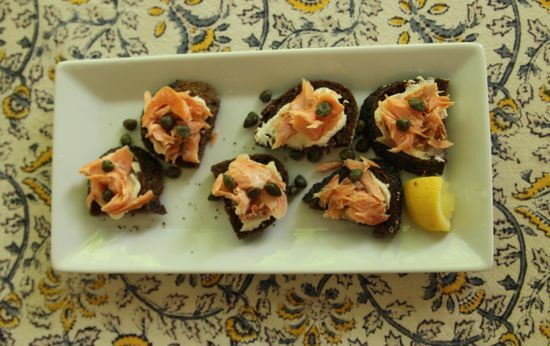 Capers will roll off and serve double duty as décor and garnish. Sprinkle with the pepper. While I love throwing dinner parties, my friends and I have recently started throwing hors d’oeuvres parties where each person brings something to share. We always get to try new things! what a lovely idea and a great way to gather together and share :-). Sunday brunch. It can be as easy as a giant fruit salad and bagels and cream cheese. Or much more elaborate with frittatas, salads, special breads and/or pastries. The beauty is I can say “come for brunch” and not commit to the complexity of the spread in advance. Brilliant. Canapes. Hmmm. Might be fun to have small nibbles that can be passed around on a tray–would make a nice change from the cheese and fruit platter that generally starts off my dinner parties! Thanks for the recipe and post. I like to go all out and serve multiple courses with enough flatware on the table to confound the guests. Anymore though all my friends know to just watch me if they don’t know which implement to use. My great grandmother’s china set has several items that were a complete mystery until the age of the internet. Until then I used the little 1 ½ inch round plates for butter, next to the bread plate. I found out that they’re actually individual salt cellars. The bone dish was also a mystery. Along with many of my friends, I come from a hotel/hospitality background. We have long thought the canapé was the King of hors d’oeuvres. A tray of assorted cold canapés, some lovely toasted almonds, a few grapes and you have it. Glad to see renewed interest! My friends and I enjoy throwing potlucks. Not because we’re too lazy to cook the entire meal ourselves, but because everyone gets to pitch in. Hmm, as soon as possible, some kind of fun party will be pulled together. Summer has truly arrived, the farmers markets are open again and beans have sprouted in the garden! Gather round people! I’m feeling inspired! I like to throw parties full of small bites and big cheese board. People can try a variety of things and there is something for everyone’s tastes. And cocktails of course! We don’t have a big place, so when we entertain it’s with small groups. One of my favorite traditions is sitting around a pot of cheese fondue with a couple of our friends and a good bottle of dry white wine. Brings back memories of when one of those friends and I were roommates in Adams-Morgan and we occasionally shared fondue heated on the stove in an old saucepan. We do it fancier now, but either way it’s delicious. We all seem to be coming out of a long winter’s hibernation. Time to fire up the wood burning pizza oven and invite friends who do not mind helping us work on our technique. An assortment of canapes would take the sting out of the all-too-often upside down pizza fiascos! we call it snacking-dinner. say it with a bad french accent and it will sound more festive. We love having summer patio get togethers! I do a lot of diner parties, but those are really a good deal of work. I like the idea of a canapes and this book looks wonderful. I think my summer entertaining will be large and small canape parties and I also like the idea of everyone bringing their own special canape. I haven’t had time to entertain nor the energy since I began my business, just a distant memory. I would love, love to have this book. I really enjoy exotic cheeses and spreads served with relish trays, pickles and spicy fruit jams. Summer after a winter such as the one we just suffered demands gathering with friends. Sangria, hard cider and a variety of cheeses, smoked meats and tasty little tidbits makes for delicious conversation. Fun! Where did you get Atlantic salmon in season? I did not think there were any wild Atlantic stocks left to catch (farmed, yes) on the East coast. I would love to get some. Tehre is nothing like Southern hospitality – rules and all. An afternoon tea or early evening cocktail hour would be an excellent use of recipes like these. I throw dinner parties all the time and so does my daughter. Not necessarily highfaluting 5 courses but a sit down dinner all the same. I grew up the grand-daughter of a true Southern Woman, who just happened to be an officer’s wife. I can remember setting the table with her and having her teach me what each piece of silver was for and where it went on the table. There’s a story my family likes to tell about my Aunt and me setting the table on Christmas day when I was four. Long story short I was irate that she was putting the fork next to the knife because I just knew I was going to be in trouble for setting the table incorrectly. To this day she and I just agree to disagree on where it goes….I know I’m right though. Thanks for a great post. I haven’t done this for a while due to belt tightening, but I would have people over for a meal and have them pick a country. I would then research some recipes from that country and cook from that country. It’s a great way to travel, if not with your body, with your pallet at least. I love social history in cookbooks….makes reading them from cover to cover such a pleasure. I always say ” I should have been born in the South”. Thank you for the (lovely) chance! My favorite way to entertain is brunch! I do not have a lot of opportunities to host a brunch, but once you get your brunch on, you wonder why you can’t make it an everyday occurrence. Summer entertaining on the back deck with cocktails and BBQ! I’ve been having small extended family dinners lately that mostly consist of our family and my brother’s family. I start off very ‘correct’ with lovely cheese set-up, little toasts, olives and vegetables cut-up. the main course goes pretty well but things keep devolving at dessert time. i bake these lovely fantastic cakes, but everyone keeps saying exactly what they want (ice cream, even Popsicles) instead! Just made homemade labneh and marinated eggplant on toasts for appetizers tonight. They were SO good! I forgot how fun finger food is. Birthday parties…. And when there aren’t any official birthdays to celebrate, unbirthday parties…. I found you through Food52 (and your lovely pound cake recipe). I love to entertain with small plates. They are less demanding because they don’t all need to come out at the same time. Hot food comes out hot and cold food comes out cold. End the “meal” with cookies or little cakes and good coffee. Simple and lovely. Who needs a reason to entertain….I love spending time with my family and friends! I like to entertain on people’s birthdays and other special occasions, although there doesn’t really need to be a reason to entertain! I am retired and have moved to a small condo. I love to entertain but do not have room to seat more than 4 comfortably at a table so my favorite way to entertain is with small easy to carry foods. I have three decks and a basement and with this type of menu, I can entertain a lot of people. I am always on the lookout for those types of recipes. Love the salmon canapés! Beautiful and healthful!